Skvělé ocenění. Maďarská verze GRABOLO JUNIOR byla nominována do soutěže HRAČKA ROKU a získala 1.místo v kategorii ” Společenská hra pro nejmenší” . 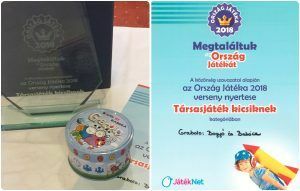 We are glad to tell you that GRABOLO BOGYÓ AND BABÓCA has been nominated for the Toy of the Year award in “Boardgame for little ones” category and it won the 1st prize! Grabolo Bogyó and Babóca is the hungary version of the GRABOLO JUNIOR.